The Suppliant Women (also called Suppliant Maidens or Suppliants) by Aeschylus is the first (or possibly the second) in a three-play sequence based on the well-known story of the daughters of Danaus, the Danaids, who fled from their home in Egypt and sailed to Argos to escape from having to marry their cousins. The other plays in the trilogy have been lost, except for fragments. 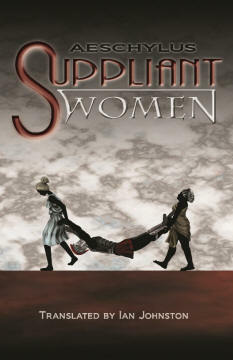 Largely for stylistic reasons (particularly the predominant role of the Chorus) Suppliant Women was long thought to be the oldest play in our traditions, but recent evidence has revealed that it is, in fact, one of Aeschylus’ late plays (first performed c. 470 BC). The arrival of the Danaids and their father in Argos and their request, in the name of the gods, for a refuge from their male cousins, who have aggressively pursued them, create serious political and moral problems for the king of Argos. What claim do these foreign petitioners have on his protection? Should he run the risk of war in order to uphold his religious obligations? What role do the people of Argos have in making that decision? Do these women have a legal right to refuse to get married? The play brings these issues—as relevant today as in ancient Greece—dramatically alive without providing any easy resolution. Ian Johnston’s new translation of a notoriously difficult Greek text provides a fluent English version of this ancient play, well suited for reading, recitation, or performance.